I have always wanted to try out Ki Neo Day Spa and I finally got the chance last week with Dennis. 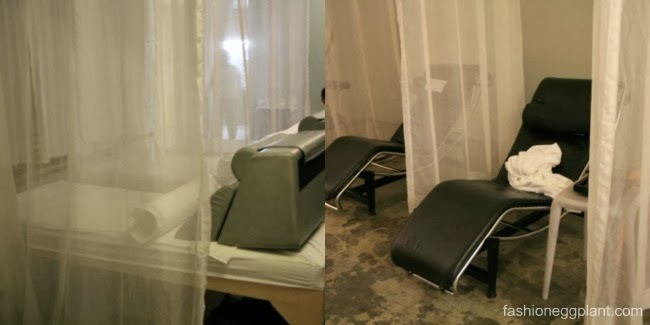 I availed their Japanese Volcanic Stone Massage (P1350 for 90 minutes) and Caviar Luxe Treatment Facial (P1950 approx 75 minutes) while Dennis had the Detox Massage (P780 for 60 minutes) and the Optimal Oxygenating Vitality Treatment Facial (P1750 approx 75 minutes). First off, the place is spotless and very serene. From it's hidden entrance located at the back of the complex to its minimalist interiors, it is indeed very zen. Second, the people who work there are extremely professional. They know their craft and are quite the experts, be it product information, techniques or personal relations. There were no noisy therapists and no cellphones in sight which totally relived me since there's nothing I hate more than to have my therapist texting during our session (and yes, this has happened to me on several occasions at different spas). Third, in my humble opinion, I no longer see Ki as a regular spa but more of a place for healing. Before we began our session, we were asked to pick which type of oil we wanted our therapist to use. The oils were named after the 5 elements and each had unique attributes: ex. water for detox, fire for heat, earth for energy and so on. Linens were clean and unscented, I especially love the height of the u-shaped facial pillow, not too high, just right so I don't have a hard time breathing which I usually experience in a face-down position. Therapist also adjusts aircon to optimal temperature before she starts. My Japanese Volcanic Stone Massage used a combination of hot and cold (volcanic) stones. Upon doing some research online, I found out that this is actually one of the most difficult techniques to master and requires proper training from licensed experts. 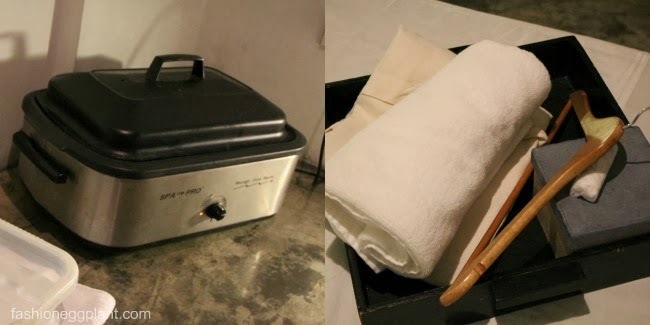 Most budget spas make the mistake of using only hot stones and have you feeling like an ironing board afterwards. Not here. This was by far, the best massage I have ever experienced in my whole life. The Volcanic stones used were ultra smooth and lubricated, it felt like butter. The entire 90 minute session which consisted of a combination of swedish, shiatsu and hot stone massages was pure bliss. I didn't realize how relaxed I was until my therapist asked me to switch sides, my body just felt so loose and my chronic lower back pain hasn't returned since then. A bit pricey but I highly recommend pampering/healing yourself once in awhile with this massage. It is definitely worth every penny and would also make an excellent gift for everyone. Dennis had the Detox Massage which is a gentle and specialized form of aromatherapy which stimulates the lymphatic system aiding in the removal of toxins and restoring your body's health by making the immune system more efficient. It is supposed to be good for the kidneys, liver and respiratory system. Aside from that, it is also said to increase metabolism and energy, regularize menstrual periods and decrease PMS as well as regenerate skin tissue for a youthful glow. Unlike regular massages, the Detox massage uses a circular motion and you are advised to drink lots of water afterwards to help flush out the toxins. Feeling your body as "light and fluffy." Temporary change in your body odor. Increased sweat. Hunger or cravings for fats. Tiredness, wanting to rest or nap. Reductions in swelling and headaches. Shifts in congestion (one sinus to another etc.) or pressure changes in joints or areas where prior injury or trauma has occurred. Dennis experienced more than one of those along with an improved sense of over all well-being. He enjoyed his session so much that he has made a vow for us to return at least once a month. In case you're wondering about the facials, we both looked extremely fresh with glowing skin afterwards. The massage that came with it was also extremely relaxing...and yes, no breakouts afterwards. Ki Neo Day Spa offers a variety of treatments, massages, scrubs and facials for different needs at various rates. In case you're iffy about spending a whole lot during your first visit, you can also avail of express treatments which start at just P340 or get a regular swedish massage (P680), manicure/pedicure or Tension Relief Massage (P320). I give Ki by Neo Day Spa a rating of 9 out of 10 stars, definitely the best spa I have tried so far in Manila.